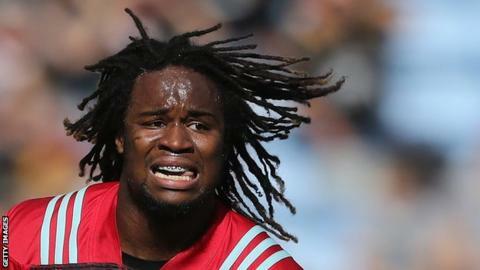 England winger Marland Yarde says there is no "bad blood" after his mid-season move from Harlequins to Sale Sharks. Yarde joined Sale on a three-year deal and was thought to be unsettled at their London-based Premiership rivals. "I thought there was a chance to have a new challenge, a clean slate and a fresh start," 25-year-old Yarde told BBC Radio Manchester. He could make his first Sale appearance against Saracens in the Anglo-Welsh Cup on Friday. Prior to leaving Harlequins, Yarde had been dropped from their Champions Cup game at Wasps for missing training and director of rugby John Kingston said letting him go was in the "best interest" of the club. "I've got no bad blood towards Harlequins. John Kingston and I never left on any wrongful terms, it was just a decision that had to be made at the time," Yarde added. "It was a culmination of a few things. Not everything has been said but it's a stance that John had to make at the time." Yarde started his professional career with London Irish in 2010 and spent four years with the Exiles before joining Quins in 2014, scoring 18 tries in 62 appearances for the west London side. "I'm a little disappointed with how it concluded because I think no player would like to leave on those terms, especially having played there for the last three or four years and being a part of that team through many highs and lows," he added. "I want to get on board as soon as possible - usually you'd have a whole pre-season to do it but it's a challenge to myself. "I am experienced enough and I have played enough games to know how to deal with stuff like that."